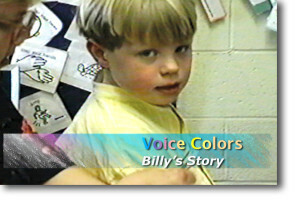 Voice Colors® – Billy’s Story is a documentary film that explores the historical challenges and strategies that enable Billy, on the autism spectrum, to become an independent communicator. This film is unique in that it presents footage from ages 3 to 16, showing Billy learning and wrestling with all that is entailed in understanding the elements involved in a social interaction. In addition to the historic perspective presented, this film offers the viewer an opportunity to see firsthand how the different communication objectives were identified and then translated into meaningful and educational experiences during the course of an educational program. This informative project will benefit any educator, therapist, or parent interested in establishing or refining a more effective communication program. Voice Colors from Voice Colors®CRM on Vimeo.